What is the ACC Network? American Society of Clinical Onc. Battier became the fourth Duke player to be named Academic All-America two or more times. Battier maintains a 3.4 GPA as a Religion major. DURHAM, N.C. - Duke senior forward Shane Battier (Birmingham, Mich.) was named the Verizon Academic All-America Team Member of the Year earlier today. Battier was also named first team Academic All-America for the second consecutive season. He joined Eric Channing of New Mexico State, Nathan Jameson of UNC Greensboro, Joseph Lumpkin of Charleston and Brandon Wolfram of UTEP as first team Verizon Academic All-Americas in 2001. Battier became the fourth Duke player to be named Academic All-America two or more times (Bob Fleischer in 1974-75, Mike Gminski 1978-80 and Jim Spanarkel in 1978-79 were the others). To be eligible for the Academic All-America, a student-athlete must have a cumulative grade point average of 3.2 or higher. Battier, who maintains a 3.4 grade point average as a Religion major, had his number 31 retired in a pregame ceremony on Feb. 21. He continues to climb several of Duke's career leader boards. In 33 games, he leads Duke in rebounding (6.8), three-point field goals made (109-tie) and attempted (254), blocked shots (72), steals (70) and charges taken (21). Battier also ranks second on the team in scoring with 19.5 points per game. 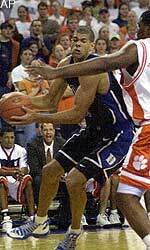 Battier's 109 three-point attempts rank second behind only Trajan Langdon (112 in 1999) and his 254 three-point attempts are tied with Langdon (254 in 1999) for first on Duke's single season charts. His 72 blocks are the sixth-highest single season total in school history and his 70 steals are 10th. Off the court, Battier is involved in several activities, including being president of the Student Basketball Council, a committee of basketball players concerned about the welfare of the game.